SiccaDania is pleased to announce a new order received from the Thailand based company, Korn Thai Co., Ltd. The order covers a new sophisticated Small scale spray dryer for production of non-dairy creamer, coconut cream powder and maltodextrin. The spray dryer is of the advanced multistage design with integrated and external fluid beds for production of dust-free agglomerated powder. The SiccaDania Small scale spray dryer is a skid-mounted unit complete with water balance tank, feed tank, feed pump, inlet air filter, direct driven pressure fan, steam heater for heating of main air, co-current high pressure nozzle atomizer, drying chamber in support with sight glass, chamber door and light source, rupture disc for protection against powder explosion, cyclone for separation of the fines from the exhaust air and finally a direct driven exhaust fan. The integrated fluid bed is installed below the drying chamber and complete with separate air supply system. The external fluid bed for powder cooling before powder discharge is installed after the integrated fluid bed. The entire process is controlled and monitored from a sophisticated PLC based control system with touch-screen operator panel. The SiccaDania Small scale plants are pre-wired and tested prior to delivery. All parts in contact with product are made of stainless steel. The plant is expected to be operational during first quarter 2018. 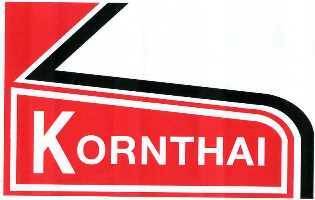 About the Korn Thai Co., Ltd.
Korn Thai Co., Ltd. is based in Thailand with production facilities in Ratchaburi province. Korn Thai Co., Ltd. employs approx. 500 people and are experts in manufacturing coconut cream powder, non-dairy creamer and 118 other products for domestic and export markets.